FLOW has joined Branch Out Columbus, a citywide partnership to plant 300,000 trees by 2020. Mayor Michael B. Coleman and Columbus City Council President Andrew J. Ginther joined the Weinland Park community, FLOW and more than 20 other non-profit organizations to announce the start of the community wide effort to plant 300,000 trees and a pilot program to develop an urban tree nursery. The newly planted trees will be part of an effort to increase the city’s urban tree canopy. The urban tree canopy in Columbus is currently estimated to cover 22% of the land (31,171 acres), according to a recent assessment led by the Columbus Recreation & Parks Division of Forestry and prepared by consultant, Plan-It-Geo. These trees provide a multitude of economic, environmental, and social benefits, conservatively valued at more than $12.1 million annually, according to the study. Mayor Coleman and residents of the Weinland Park neighborhood also announced a pilot program for an urban tree nursery. The vacant land, owned by the City of Columbus’ Land Bank and Campus Partners, on 8th Avenue near 5th Avenue will be the city’s first Urban Tree Nursery. The vision is for the nursery to be a place where trees can grow to be planted in the neighborhood and where residents can learn about the importance of trees and how to properly care for them. The goal is to have at least four urban tree nurseries established in target neighborhoods by the year 2020. An executive order will be prepared to preserve and restore trees on all city led construction projects. To help residents on private property, the City will pay up to a $50 rebate to plant native trees on their property while supplies last (currently there are enough funds for approximately 400 trees). The program is part of the Columbus GreenSpot Backyard Conservation Program . For more information about the Branch Out Columbus- 300,000 trees by 2020 campaign, and to see a copy of the Urban Tree Canopy Assessment, please visit www.columbus.gov/branchout . 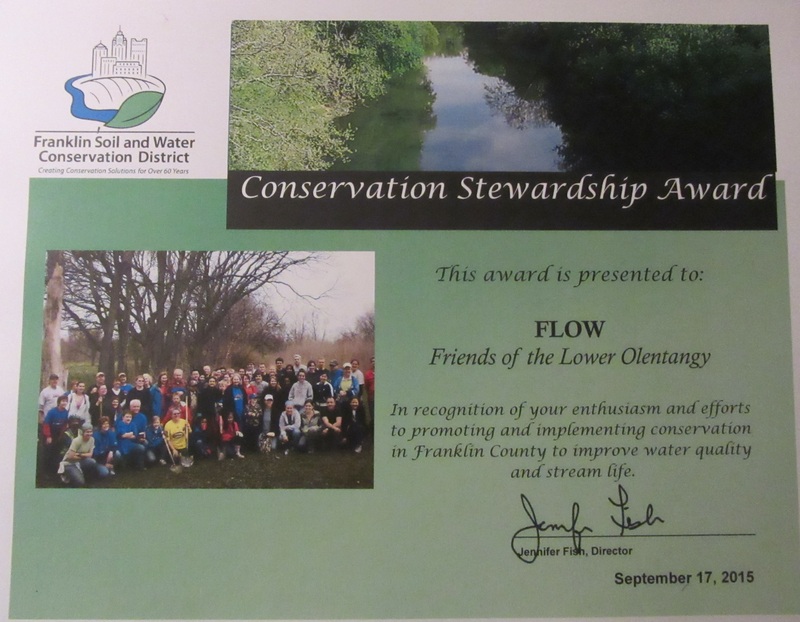 Friends of the Lower Olentangy Watershed received a Conservation Stewardship Award from the Franklin County Soil and Water Conservation District. FLOW was recognized for its enthusiasm and efforts toward promoting and improving water quality and stream life in Franklin County.